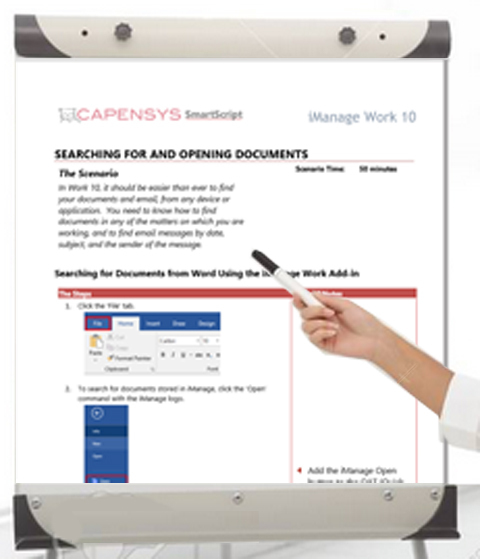 You are here: Home / News / Capensys Trainer and User Guides just got even better! Capensys Trainer and User Guides just got even better! Our trainer scripts and companion users exercise guides now have even more depth with additional tips and trainer notes. They are still very easy to tailor to your environment and cover all the workflows needed for a successful rollout and ongoing training program. We have these for all of Office 2016 as well as iManage, Work 10, NetDocuments and many other legal applications. They make the ideal training blend together with the Capensys online learning library and the instructors we can provide. Contact us to see how you can easily make your rollouts a success. Learn all about our Capensys online learning library. https://capensys.com/wp-content/uploads/2017/08/owl_red.jpg 86 99 janis richman https://capensys.com/wp-content/uploads/2017/05/Capensys_Logo-300x59.jpg janis richman2018-11-19 15:17:222019-01-17 20:48:57Capensys Trainer and User Guides just got even better!